When the nurturing nature of women meets the loyalty and unguarded affection of dogs, remarkable connections ensue. You’ll be entertained, inspired, and moved by shelter dogs, police K-9s, dogs rescued from hurricanes and dog fighting, service dogs helping returning veterans, prison inmates who train service dogs, and everyday mutts who transform lives just by providing an exuberant welcome at the end of the day. 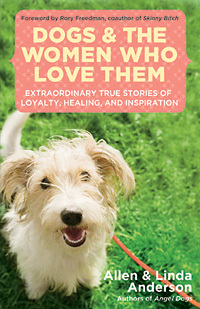 In their new book, Dogs and the Women Who Love Them, Linda and Allen Anderson showcase stories about feminine-canine connections that result in the courageous and compassionate acts of love and healing — for the dogs, the women and all the people whose lives they touch. Your audience will laugh, smile and be moved by shelter dogs and everyday mutts who transform lives, sometimes just by providing an exhuberant welcome at the end of the day (they known what’s for dinner). For more information or to purchase the book, please click here. 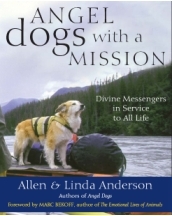 Allen and Linda Anderson are speakers and authors of a series of tweleve popular books about the spiritual relationships between people and animals. They co-founded the Angel Animals Network in 1996 to increase love and respect for all life through the power of story.